If you live in an area of the world where your vines are producing fruit right now, get outside and take a look at that fruit together. 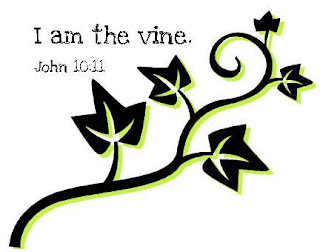 Notice how the fruit that is attached to the vine is growing, beautiful, and tasty. Notice that the fruit that has fallen off of the vine is shriveled and squashed. If you live in an area of the world where the vines are still shivering in the cold (like ours are! ), the grocery store will have to suffice. With your tot, examine the vine-ripened tomatoes or the grapes. Point out that the fruit could only grow while it was attached to the vine. That's how it receives it's food and water. Memorize the verse and draw a vine around your poster, attaching a picture of each person in your family. As you work on this project, you can say, "Our family stays attached to the vine: Jesus!" You can get images to download for your poster here too! For more Bible lessons, try www.abcjesuslovesme.com This is the preschool curriculum that we use!